I recently thought of some ideas for ReShade, and I would be interested to hear what you think about them. Some of these are kind of more technical, but I hope that I made them understandable enough for everyone. It would be awesome to be able to layer on different effects as needed. Allow users to sort the rendering-order of shaders by drag + drop. Render anti-aliasing or depth of field first? The user can decide. Also allow for the same effect to be added multiple times. Also make the settings editable on a per-layer basis, which would get rid of the settings-portion on the current editing-window entirely, as it is not needed anymore. This would make creating presets much easier and more customizable. 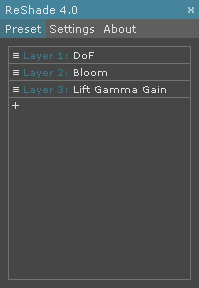 Allow users to add depth, luma and chroma filters to the different layers (mentioned above). Perhaps on input and output. Only apply bloom to the sky, or make colored pixels brighter. Also allow users to layer multiple filters on effects (make them act like sub-layers). Only load the effects that are currently needed. This would reduce load-times and RAM-usage. Also add support for multicore effect-caching (assign 1 loading-process to each core), this would speed up the loading of effects IMMENSLY. Alternatively, caching could be made passive in some way (do not stop the game while caching effects by slowing the loading down, for example). I might make more images later. But making that one was complicated enough. Please tell me what you think! I am interested to discuss all kinds of different ideas. Last Edit: 1 year 9 months ago by GERgta. 1) You can already sort order by drag and drop. Try it. My average goes LUT -> Lumasharpen -> Bloom -> Matso DOF -> Film Grain. 2) Having effect masks/overlays would be really cool, but I'm not sure how easy it would be to implement. You can already see some of this in RBM (can exclude certain colors) and Film Grain (can have a reversed luminosity mask - dark areas only), and the effect is really nice. 3) I don't think the benefits are worth whatever it'd take to implement that. As it is my shaders take less time to load than the game's main menu, so any faster than that would be redundant since they only load once. I also can't imagine the RAM usage improvement would by anything better than negligible. I believe posting ideas is futile. There have been posts with a bunch of suggestions before but there haven't been any significant updates on ReShade by the community. My guess is that ReShade, besides some minor bugfixes, won't evolve past this point. Oh and perhaps during shader load, let the user see what shader is currently loading. Some shaders can take a long time, and if it's not a shader you usually use during gameplay, you could delete that shader and speed up the loading process. Other than that, more sweet shaders are always welcome. Last Edit: 1 year 9 months ago by Insomnia. It's open-source on Github if you know how to implement any ideas you have. What makes me sad is that 3.0 is really good, but it's lacking so many shaders it had before and some shaders are lacking features that were previously in older versions of Reshade. The community was buzzing just a year or two ago. Even Gonassa is gone with his awesome shaders, many of which never got some of the awesome future features Gonassa teased. That's kind of sad, oh well. You can already sort order by drag and drop. Try it. My average goes LUT -> Lumasharpen -> Bloom -> Matso DOF -> Film Grain. I tried doing this previously, it did not work. I tried it again now, and I did not realize that you had to extend the kinda categories to do that. I don't think the benefits are worth whatever it'd take to implement that. As it is my shaders take less time to load than the game's main menu, so any faster than that would be redundant since they only load once. I also can't imagine the RAM usage improvement would by anything better than negligible. Well they do slow down loading times. Furthermore they also re-initialize after going back into the application. Some older games also switch resolution between menus and ingame, which causes the shaders to re-initialize, too. How fast shaders load is also dependant on the game. I think implementing this would be good. I'm sure not many are aware of this, but I'm hard at work on a custom version of ReShade that supports quite a few of these features already and ultimately aims to support most of the stuff requested here. It seems unlikely that I will ever be able to merge it with the official version of ReShade since it relies on my own graphics debugging framework for D3D state machine tracking and my own input systems. I'm slowly feeding back the minor fixes that I can into the official project, but Special K + ReShade is a radically different beast with different goals. In fact, I had zero interest in ReShade at all until I was able to create a system for D3D11 games where ReShade can post-process specific game render passes rather than simply processing the final frame. Aside from explicitly post-processing render passes (i.e. don't screw up the UI, or apply MXAO before smoke effects), I've also tackled system-wide installation of ReShade, per-game profile management, depth buffer selection and support for configuring everything using a gamepad. I don't really want to point people _off_ of these forums, but if you are interested in this stuff, I have a mod group on the Steam forums where I chronicle the development of this stuff.